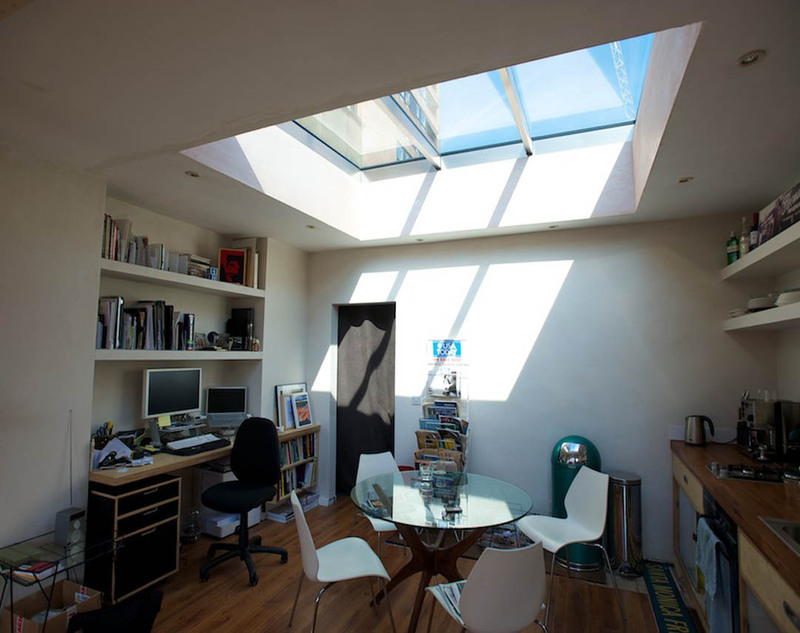 A compact top floor flat in Soho with no outside space was entirely transformed by the addition of a retractable flat glass roof. Before work began our client clambered up a ladder to the outside of the roof to get more daylight and to access his roof top rowing machine. The living space is now filled with light and, at the press of a button, with unlimited fresh air. This roof opens approximately 30% of the area beneath, making a very dramatic change to the relatively small room. Difficult access resulted in this roof being installed largely by hand. The project was also designed to have three panes of glass in order to minimise potentially challenging handling logistics. As with all of our installations, battery-powered closing systems can be used in case of a power or systems failure. This also applies here where the roof closes by travelling up the slope of the pitch. A rain sensor automatically closes the roof at the first hint of rain, preserving the interior finishes and furniture.